It’s moments like this that I love living in Sydney. The nondescript door is locked and only opened after a little furtive knuckle rapping. Opened, and in we go… I’m in heaven. The place is tiny and filled with antique loveliness, vintage books, puffy chairs, and cruisey beats coming from the corner. We are here for high tea and if I was more of a girly girl there would have been a high pitched squeal of delight and a little hand clapping with glee. Instead, I smiled from ear to ear and willed our late friends to hurry up so I could see we what the cake selection was like. 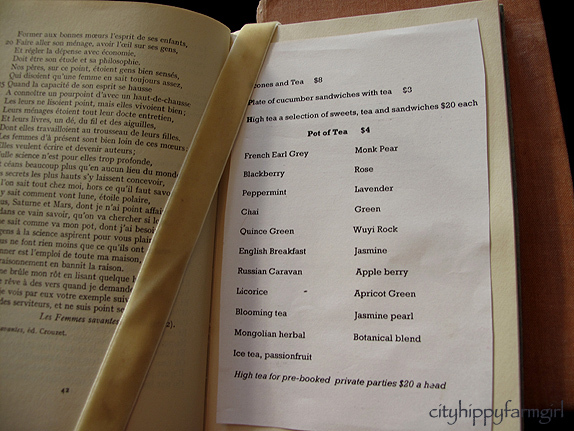 They have a long tea selection, with the menu slotted between pages of old books. 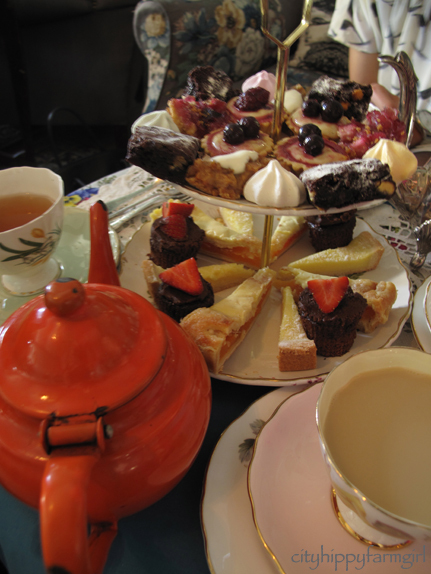 Tea comes out in individual tea pots, and the cakes sit beautifully on their tiered elegance. Put a cucumber sandwich on an every day plate and I’ll easily pass it up. However, cut it in to triangles, place them on a beautiful antique plate and you’ll hear a little sigh of contentment. 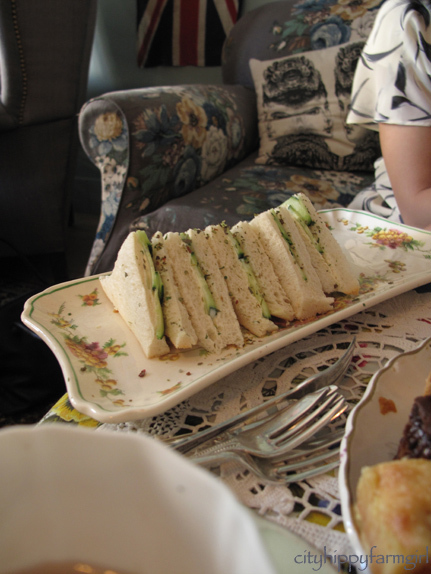 High Tea is something that I love. I love every little part of it and this little secret place might just be my favourite so far. 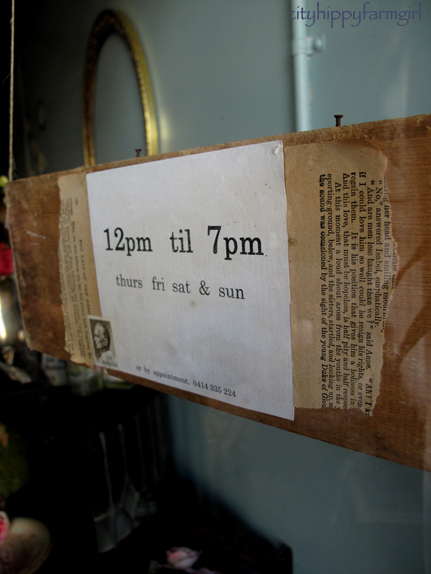 This entry was posted in Connecting with Community and tagged high tea, redfern, sydney, Tea Parlour, vintage by cityhippyfarmgirl. Bookmark the permalink. That IS a great find! Thanks Brydie! I love the ribbon on the buck. Looks like a fun place. What a fantastic find. Sounds like a lovely way to spend time with your friends. What a clever idea – the air of mystery is bound to add to the intrigue, and I just love the bow around the stag’s neck – very sweet. I think I would be in heaven here. 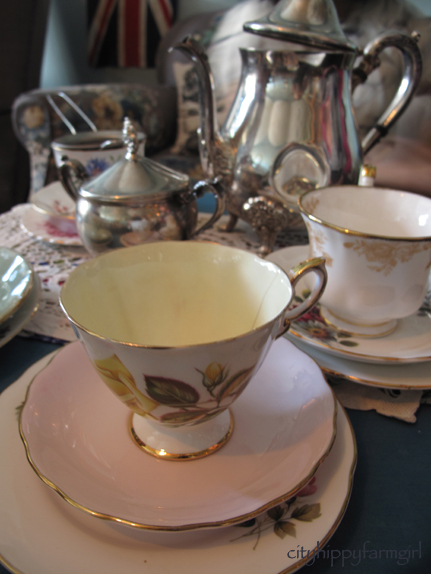 Those cups, the dainty cakes, the quaintness of it all…. What tea did you order? I think I would’ve tried the lavender. Sorry, excuse the pedantic Brit. I’ll show myself out…. Thanks to you the pedantic Brit, I now know the difference between high tea and low tea, (or afternoon tea) and you are quite right! Thank you Richard and thank you Wikipedia. Pinkies up! That looks like so much fun…here we have tea parties for little girls (at a ridiculous price due to the swank party part of it.) I miss high tea with my grandmother’s next door neighbor from Scotland…I miss her shortbread. Oh I would love it there! What a pretty find. Yes, something immediately swoon-inducing about fine china, nibble sized morsels and wonderful company. That said, those petite servings are very deceiving – there has been more than one occasion where I’ve waddled out of a tea room. I see clotted cream and raspberry jam and it seems to activate something dangerous within! how wonderful, a pop up tea place, I would so adore to go somewhere like that. I love your photos of it. 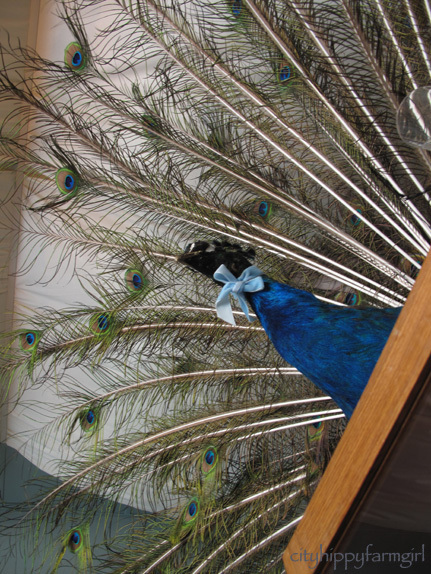 Love the peacock feathers, they add a touch of loucheness to the whole story. Where is it supposed to be reminiscent of do you think? 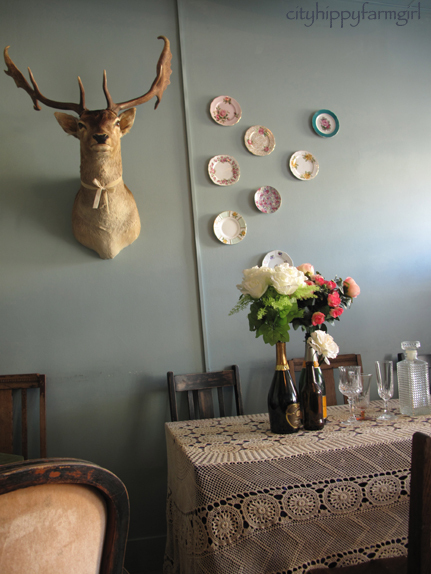 Is it an old Aussie style tea room? I know little of the history of eating establishments but I’m guessing they were very popular at one point in time. Kind of reminds me of the Welsh community in Gaiman in Patagonia, an even more unlikely spot to find cucumber sarnies. This is so lovely. What a wonderful way to spend an afternoon! This looks like a special place to go and have tea. So sweet. That’s exactly what I imagine heaven to be like! And this is what I miss in Perth! Amazing. This looks like such adorable place. I know I will love it. Thank you for introducing it to me.